Address: Indian railway diesel locomotive works Office of the General Manager (Personnel), 2nd Floor, Administrator building, and Varanasi - 221004. Olympic Games (Senior Category) / Gold medal in Asian Games. India Ranking shall be considered for these purposes. (I) -A crossed Bank Draft of any Scheduled Bank OR Cash receipt paid in Cash Office, DLW of Rs.500/-(Five hundred only) payable (For all candidates except those mentioned in sub-para 7 (II) )in favor of &quota; The Principal Financial Advisor ”, DLW, Varanasi payable at Varanasi should be enclosed along with the application. (II) -A crossed Bank Draft of any Scheduled Bank OR Cash receipt paid in Cash Office, DLW of Rs.250/- (Two hundred Fifty only) payable (For all candidates belonging to SC/ST/Minorities/Women and Economic Backward Classes) in favor of “The Principal Financial Advisor”, DLW, Varanasi payable at Varanasi should be enclosed along with the application, this amount will be refunded to those applicants who actually appear in the trial. Note: Bank Draft of any Scheduled Bank /Cash receipt paid in Cash Office, DLW Prior to issue date of notification will not be accepted. How to apply: Eligible applicant require to send their official website http://www.dlw.indianrailways.gov.in. After filling the application form, candidate must send hard copy of application along with relevant testimonials (Mentioned in Detailed Advertisement) to the following Address before or on 13.11.2017. Applicants may also leave their application form in DROP BOX in GM (P) office, DLW, Varanasi. Applications received after last date will not be entertained. Postal delay shall not be entertained / more than one form in single envelope will liable to be rejected. Write on the envelope “application for the post of Sport Persons”. Last Date for Receiving of Offline Application Form Is: 13.11.2017. DLW Varanasi, Indian nationals has published advt. no.1/-03/2015/16 25 Discipline: Sports Quota (Men Only) vacancies in DLW. Applicants who having ITI certificate or matriculation can apply through the prescribed format before 05.09.2015. Applicants may send application form to Indian Railway, Diesel Locomotive Works (DLW). 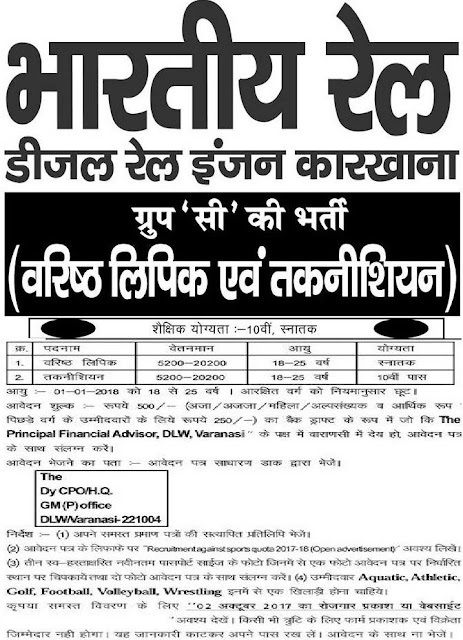 Applicants form is available on Indian Railway, Diesel Locomotive Works (DLW) website. Selection: Written exam rail and Interview. Age Limit: 18-25 years as on 01.01.2016. How to apply: Eligible applicant require to send their application along with format along with recent passport size photograph, two self-addressed envelopes (one stamped of Rs.5/- & one unstamped), copies of relevant documents and in an envelope should be super scribed as the Employment no., post and “Recruitment against sports quota 2015.16( Open advertisement)” by General post to the D y CPO/ H.Q., GM(P) office, DLW/ Varanasi-221004 on or before 30.11.2015 at 16:45 Hrs. and 1.-12.2015 at 16:45 Hrs. for Remote Areas. Write on the envelope “application for the post of Discipline: Sports Quota (Men Only)”. Last Date for Receipt of Applications: 30.11.2015 at 16:45 Hrs. Last Date for Receipt of Application for Remote Areas: 15.12.2015 at 16:45 Hrs.